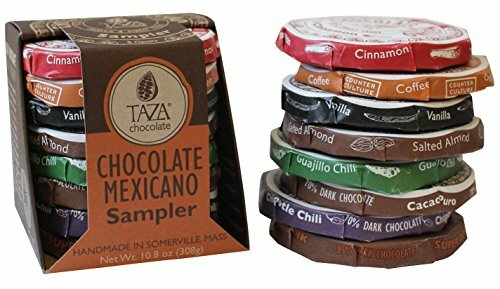 Try every flavor of Taza’s Chocolate Mexicano discs! This colorful gift is a fun, affordable way to sample and share stone ground chocolate with true grit. Eight bright, bold flavors range from spicy to sweet to savory. Contains 8 x 1.35 oz Chocolate Mexicano Discs: Cacao Puro, Chipotle Chili, Cinnamon, Coffee, Guajillo Chili, 85% Super Dark, Salted Almond, and Vanilla.